In addition, Iranian president Mahmoud Ahmadinejad indicated that Iran may be studying the use of its new space capabilities for a rudimentary antisatellite weapons capability, by noting that the new booster will enable Iran to fly missions up to 621 mi. (1,000 km.) altitude. Ahmadinejad did not mention ASAT capabilities specifically, but he noted that "everyone knows that reaching a 1,000 km. orbit allows you to 'reach' all other orbits." The U.S. Air Force Space Command can not assume that an openly hostile country like Iran will not pursue ASAT weapons after China illustrated how a country with limited space capability can change the strategic situation in space by demonstrating an ASAT. That is something the U.S. proved in the 1960s by setting off a nuclear weapons test in space which generated a powerful electromagnetic pulse that would have reached and disabled any other spacecraft within hundreds of miles of the test. The U.S. then deployed small nuclear weapons on Thor boosters on Johnston Atoll in the Pacific as ASAT weapons to deter the Soviet Union. If Iran is able to develop nuclear warheads, it could simultaneously threaten U.S. space policy and many U.S. military spacecraft by having even a single nuclear ASAT ready to ruin any unhardened U.S. spacecraft. The new Iranian developments come as the country is swept by internal protests. Iran has also generated more international concern over its nuclear program by announcing that it will process uranium to a purity more suitable for nuclear weapons. Israel has also expressed concern over the imaging spacecraft's development fearing it will enhance Iranian ballistic missile targeting. Iran says the first launch of the new 290,000 lb. thrust Simorgh (Phoenix) rocket is planned for February or March. The unveiling was hosted by Ahmadinejad to commemorate the first anniversary of Iran's first satellite launch in February 2009. It also was to celebrate the anniversary of the 1979 Iranian revolution. As part of the commemoration, Iran launched a 10 ft. long sounding rocket off a truck mounted rail system. But the test created global confusion when Iran used the word "satellite" to describe the suborbital payload it also said was housed in a "capsule." Those buzz words satellite and capsule then led several international news organizations into inaccurately crediting Iran with launching a space mission into orbit, as opposed to just a the suborbital flight that fell back to Earth near its launch site within about 15 min. of liftoff. Some media even used the simple sounding rocket firing to credit Iran with major progress in development of propulsion capability tied to its ballistic missile program. But the Iranian Kavoshgar 3 (Explorer) sounding rocket flight was fired straight up on a battlefield artillery rocket developed decades ago. The rocket resembled the U.S. Army Honest John battlefield rocket deployed in the 1950s. But its nose was a more modern sounding rocket design. The Iranian rocket reached 125 mi. altitude, providing the animals with several minutes of zero-g as the vehicle arched over at apogee. It then descended and landed by parachute a few miles from its launch point. Some news outlets also heralded Iran's feat of launching living creatures into space on board the vehicle. Iran did place an instrumented rat, turtles and common earth worms on board to start rudimentary life sciences investigations. But that too was hardly a major milestone, as sounding rocket flights with laboratory animals are conducted often, even by university student rocket programs. And such flights are not new, having been done for 200 years. It was 1806 when Claude Ruggieri, an Italian living in Paris, first rocketed small animals to high altitudes which were then recovered by parachute. Toloo (Dawn) imaging satellite: The 220 lb. 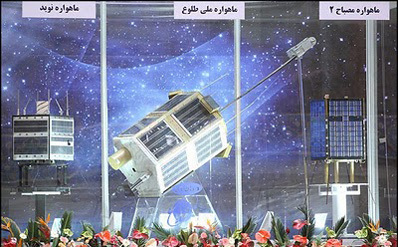 rectangular-shaped satellite is the largest of Iran's new spacecraft. It may be launched as early as this month or in March, the Iranians said. "Toloo is a satellite that will be used for remote survey," said Defense Minister Ahmad Vahidi. It will be launched into a 300 mi. orbit and is designed to operate for three years, Vahidi said. It was built by the Iran Electronics Industries Co. It may well be a dual-use payload for both civil and military ground imaging purposes. But even a medium resolution system would enable Iran to better target military sites in Israel such as Israeli Arrow anti-ballistic missile facilities. China and Iran have been together developing CCD camera systems for use in small spacecraft. Several years ago, while in Beijing attending a remote sensing conference, this editor ran into an Iranian space team that was holding open discussions with the Chinese on the development of such satellite imaging systems. Navid (Good News) communications satellite: This low altitude spacecraft has been developed in part by engineering students. It is designed to provide store and forward communications services. Mesbah-2: This is also a store and forward communications satellite design planned for launch in 2011. Iran used a tall slender liquid-fueled Safir rocket to launch its initial "Omid" small communications satellite in 2009. It was preparing to launch another Safir in late 2009, but abandoned that mission in favor of using the new launcher. That has involved developing the new Simorgh ICBM into a two-stage launch vehicle. This booster and its upper stage have more relevance to ICBM range extension than does the Safir, which is a rather fragile rocket requiring significant ground support. The Simorgh rocket is 89 ft. long, and has a mass of 85 tons. Its first stage uses a four nozzle propulsion system with 290,000 lb. of liftoff thrust. The Iranians did not provide any significant information on the vehicle's upper stage, possibly because that directly involves use of the same configuration for an ICBM.